If your company is giving access to Heroku Postgres proprietary databases to many or even few users, there is always a risk of data being mishandled or stolen. Use DataSunrise Sensitive Data Discovery tool, if you don’t want that to happen! 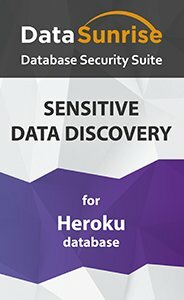 By using Sensitive Data Discovery for Heroku Postgres you can find sensitive data that need your special attention and protection. Once discovered this data can be masked, audited and secured! Protecting sensitive data is a must now for any company. And the 1st step to protection is understanding what data needs protection. Luckily, DataSunrise Database Protection Suite has a built-in mechanism to discover sensitive data that needs protection in accordance with national and international regulations. A universal solution from DataSunrise for Heroku Postgres is called Sensitive Data Discovery. It uses predefined filters to search for specific types of data. By default, these filters are set to find data that is classified as financial (for example, PIN number, credit card number, Tax ID, etc. ), geographical, personal, etc. However, the Sensitive Data Discovery tool can do more than that. Database owners and admins can set up their own search criteria and find information meeting their specific criteria. The Sensitive Data Discovery tool for Heroku Postgres can be set to look for required data in the exact place. To do that you just need to specify a database name and name of a schema. Activity monitoring. Auditing all database-related requests and actions. Masking. Dynamic and static obfuscation of data. Security. Control over all requests to a database and prevention of unwanted requests. DataSunrise offers a comprehensive solution that will keep your data under your control at all times.